! APPOLOGIES, REGISTRATIONS ARE CLOSED. THIS EVENT IS FULLY BOOKED ! If you believe in the potential of some of your co-workers, send them to Brussels for 2 days to boost their career and knowledge! 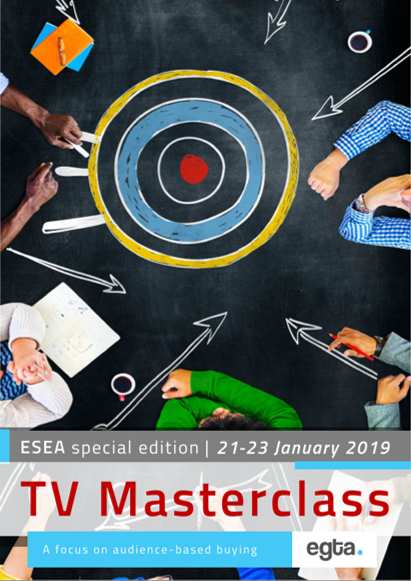 Join the very first of its kind TV Audience Buying Masterclass! An egta exclusivity! Target group: We leave it up entirely to each company to decide who is best fitted to attend such a meeting. The ideal candidate should however have a perfect understanding of their company’s pricing and sales methods, and ideally be able to suggest and implement changes to the company’s strategy, following up on this training. To limit the size of the group and guarantee a qualitative interaction, we will kindly ask you to limit the number of participants to maximum two per company. Aim: The goal of these two days is to get a good grasp on the strategical opportunities offered by audience buying solutions, as this increasingly common practice in the USA slowly becomes a reality in Europe. Our two experts on the matter, Howard Shimmel (former Chief Research officer at Turner USA) and Gerhard Broussard (who has a large experience on the media agency side - read more about their experience in the document attached) will explain in details how this pricing and sales method is applied in the USA and how it is transforming the video market there. Through six modules, they will share their American experience and analyse with participants if and how audience buying can be applied in the various European market. They will help participants draw an action plan that is specific to their reality.